What is the greatest threat to the Gila? 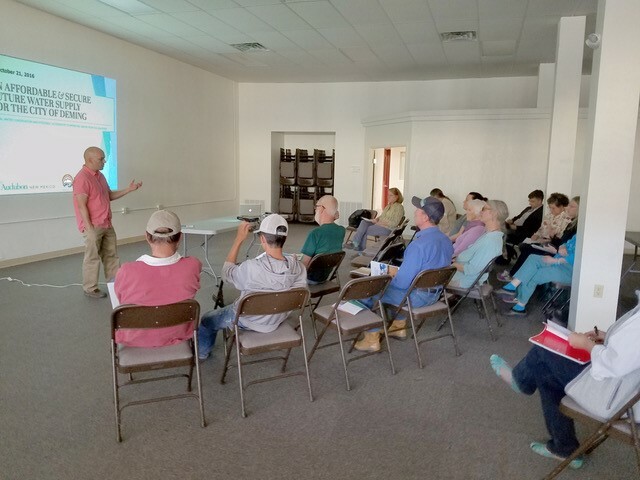 At our October monthly program, Carol and Mike Fugagli captivated the audience with a talk about how the Upper Gila Watershed could become a climate refugia for birds. They have devoted considerable effort to studying the Gila Wilderness near the confluence of Sapillo Creek with the Gila River. They illustrated their talk with splendid photographs of birds that may seek out this region because of climate change as well as stunning scenes of the riparian corridor. Action? 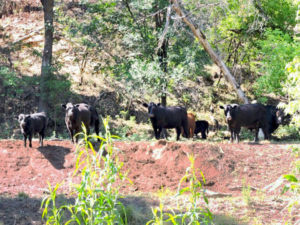 During the questions following their talk, it was pointed out that the most effective action that people can take is to contact the Forest Service and request action to remove feral cattle from the Gila Wilderness. An environmental impact statement (EIS) for proposed diversions on the Gila and San Francisco Rivers, called the New Mexico Unit of the Central Arizona Project (CAP), has begun. The first phase, called scoping, is designed to solicit public input. The Bureau of Reclamation, the Interstate Stream Commission and a private contractor (EMPSi), will review the comments and conduct additional evaluations to prepare a Draft EIS. The Draft EIS is scheduled to be completed sometime in early 2019. After it is published the public will have one final opportunity to make comments. The Final EIS goes to the Secretary of the Interior who will make a decision by the end of 2019. The New Mexico Unit consists of diversion structures, storage ponds, and conveyances (ditches) that would deliver water to a few farmers in the Gila, Virden and, potentially, Pleasanton areas. A diversion structure is a dam that does not store water behind it but can still span the full width of the river. SWNMA and many other environmental organizations are very concerned about the environmental impacts of a NM Unit on the Gila and San Francisco Rivers. We will be a voice for the river when the final comment period opens. We will keep you informed of how you can also make comments on the Draft EIS, which will be the public’s last chance to influence the EIS process. We are also strong proponents for using the millions of dollars from the Arizona Water Settlements Act to help all of the residents of southwest New Mexico. There are many great ways to provide long-term water security for our region that do not involve diverting the Gila River. Sharing stories from Gila River that drive our work today. Terry Timme of Southwestern New Mexico Audubon Society shares a bit from the chapter’s origin story and how the Gila River moves their conservation work forward today. “Several residents of Silver City who had a deep love affair with the river and the bird life it supported saw that they could more effectively fight for protection of the river as a part of the Audubon Society. One of those people was Marian Zimmerman, a founding member of SWNMAS. Marian was a consummate birder and botanist. She and her husband, Dale, have been a guiding light for conservation of the Gila River for decades. Upon her death in 2011, Dale established the Zimmerman Wildlife Conservation Endowment through Audubon New Mexico (ANM) to honor his love for his wife and the Gila River. The Chapter continued to engage in Gila River conservation over the decades as more dams and diversions were proposed. Today, the Arizona Water Settlements Act (AWSA), passed by Congress in 2004, is the most pressing threat to the Gila River that SNWMAS members are engaged in. The AWSA provides $66 million in funds to meet water supply needs in Southwestern New Mexico. The Act also authorized separate construction funding for diversions on the Gila and San Francisco Rivers that could remove up to 14,000 acre-feet of water per year. SWNMAS, as well as Audubon New Mexico, have been actively encouraging the use of the appropriated taxpayer funds to meet multiple water needs in the four counties that make up Southwest New Mexico by funding non-diversion alternative projects that would provide water security for the region into the future. Supplying water for people through thoughtful water alternatives keeps water for wildlife flowing. SWNMAS’ foundation was built on protecting the Gila River and a deep love for community. A more recent love story echoes that of Marian and her husband Dale. Sara Boyett, former President and current Program Chair, and Terry Timme, current President, discovered that they shared not just a love for the Gila River but also for each other. After years of working together to help the chapter protect the Gila River, they were married in 2016. They playfully suggest that their wedding vows should have included, “what Audubon has brought together, let no one put asunder.” They continue to be actively engaged in the struggle to find sensible solutions and common ground for all sides in the AWSA process and enjoy birding along the river that brought them together. In New Mexico, water is love, life, livelihood, and according to a recent survey done by Colorado College, one of the first things on everyone’s minds. In New Mexico, rivers fuel a $9.9 billion outdoor recreation economy -- more reason to protect one of New Mexico’s last free flowing rivers, the Gila. New Mexicans’ love of their land and water runs deep. 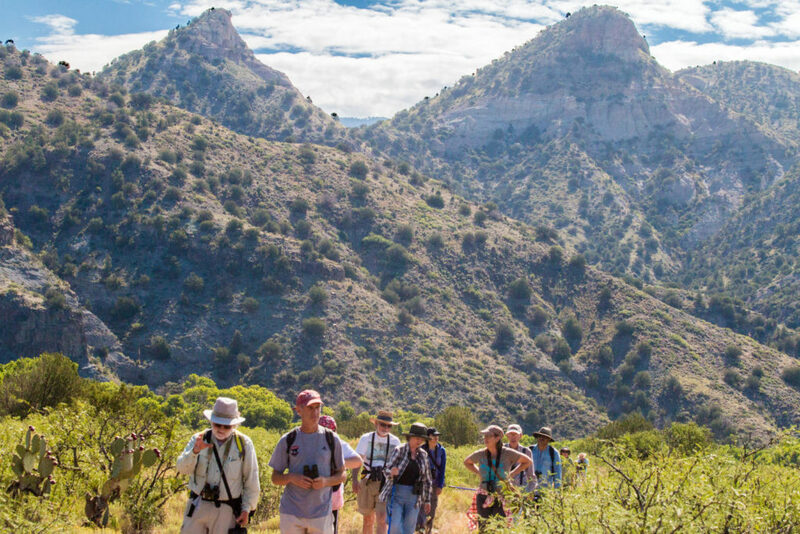 Seventy-eight percent of New Mexicans’ think the presence of public lands and our lifestyle of outdoor recreation make New Mexico a great place to live. In fact, New Mexicans are as concerned with inadequate water supplies, low levels of water in rivers, and pollution of rivers, lakes, and streams as they are with unemployment. It is no wonder so many love stories grow out of the river when we spend so much time on them, thinking about them, loving them. Arrange a presentation for your civic group, call Lisa, 534-9284. SWNMAS holds Deming Audubon periodic meetings and everyone is invited to join us at the La Fonda restaurant at 5:15 pm. The restaurant is located at 601 East Pine Street in Deming. See and hear interesting meeting topics while enjoying Deming’s Mexican food. For meeting information, contact us: swnmaudubon@gmail.com. The Gila River, New Mexico's last wild river, has been named one of the country’s most endangered by American Rivers. Healthy rivers are essential to our livelihoods and wildlife. Audubon New Mexico is working to improve river health and resiliency. We CAN help. Jorge Figueroa (pictured) discussed the recent Audubon New Mexico and Western Resource Advocates report offering affordable water conservation and efficiency solutions to help Deming, Southwest New Mexico’s largest community, meet future water needs, save tens of millions of dollars in capital improvements and protect the state’s crown jewel, the Gila River. Proposed water diversions from the river could be catastrophic to Important Bird Areas, the river’s health, and its uniqueness as the state’s (and one of the West’s) last great free-flowing rivers. The solutions proposed in the report would help build resiliency to drought, safeguard birds, and protect the Gila River—a sacred and culturally irreplaceable natural landscape in our state.